One of my favorite genres!!! The whole… “surviving in a deserted *area* with a stranger” thing. I LOVE THAT! ‘Cause it’s already sheer torture considering you’re in “survival” mode and in a desperate state, but to have to depend on (or trust!) someone you don’t really know (or know at all), to aid in your survival is even scarier. Or maybe more exciting. To me? More exciting. ‘Cause WHO the heck wants to be on a deserted island, or stuck in the thick of the rainforest, or be in a dystopian world (where it’s all about survival of the fittest)… alone? To be with someone you don’t know at all, and maybe don’t like or trust, is scary. But to be completely alone? Even scarier, if you ask me. Best with a “partner” but let’s hope he or she is a true teammate. And in our favorite books? A romance potential!!! *claps* :D!!!! Theresa: Maryse, can’t believe you have not read Withering Hope! I even had my husband read it. Move to this weekend. I know lots of good reads but I enjoyed that one. Not erotica, true old fashion romance with just enough of a different story line to make it an interesting page turner. So the minute I realized that this was one of “those” I knew I had to read it ASAP!!!! Thank you so much, Jacqueline (and Theresa), for putting it on your favorites list, ’cause I didn’t realize this one was one of MY kind of reads, and I had a GREAT weekend living this nightmare… and kind of a dream… considering the amazing love story! 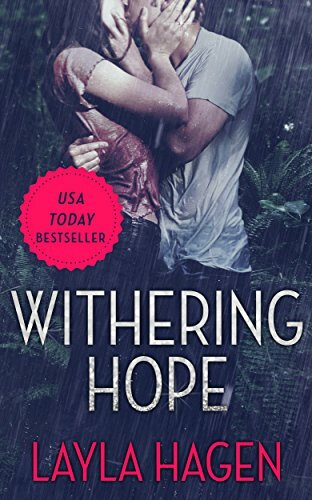 Maryse: Enjoying this book right now ➜ Withering Hope by Layla Hagen. She’s getting married, and on a flight to remote location, her plane crashes, and she and her pilot are stuck in the rainforest. Oh I just LOVE books about survival and desperation, fear and hope, and maybe triumph… and love. “Such a normal act… receiving flowers. It unsettles me. I try hard not to think about my normal life at home on any day. Most of the time I succeed, when I lose myself in tasks such as fence building or food searching. But this is a drop of normalcy in the vertigo of madness. A reminder that there’s more to life than survival. Even here.” <— GAH!! I LOVE THAT. Theresa: Without spoiling, it gets better and better. Michelle: I liked this one! The last quarter of this book, soooooooo good. While the writing was a bit choppy, for me at first (or maybe overall. I either got used to it, or maybe it found it’s rhythm? ), but either way, at times I found the dialogue and the thought process and “living” were not detailed enough it terms of “action” and patches of time that went on that we don’t really get to experience with them. It’s told from both POV’s at first, but MOSTLY hers – which I prefer. In fact towards the middle all the way through to the end, it is pretty much ALL her. That said, the story as a whole captivated me. Even when I found myself huffing a bit over the time “skips” and the condensed style of writing. This book is listed as a little over 250 pages, and I know, had it been over 350, we would have been ROCKING a 5-star read! Aimee is getting married to a wealthy man (kind of her “brother” by way that she was raised WITH him since she was a young girl). They’ve been best friends all of their lives and fell in love and decided to marry. Tristan is their pilot and driver, and while Aimee has known Tristan for years, he is very closed off, and they have never really bonded. But when she and Tristan (piloting the plane), head to Brazil for the wedding preparations, crash in the middle of the rainforest… somewhere… they have no choice but to get to know one another. I turn to look at the jungle instead. The wilderness unnerves me even more. “Beautiful, isn’t it?” he asks. AND OMG!!!! It get’s INTENSE. Scary (nurmeous times – of course!!! Hello… stuck in the rainforest with pretty much NOTHING but wild animals and toxic plants… and bugs!!!!). Also, Tristan isn’t one to interact much. Not the chatty kind of man that she was hoping he’d be. it’s not just the darkness that suffocates me. It’s the routine of every day, the repetitive tasks required for survival. They threaten to drive me crazy. She’s stronger than I thought. Extreme conditions tend to bring out the worst in people. But not her, though she looks so fragile. …they have no choice but to becomes close to each other. Before she can give me peace, I will take hers away. And she will hate me for it. but this “plot line” kind of falls apart for me. I get it, I get him and his thought process, but it didn’t really amount to “much” in the grand scheme of the story, when I was sure it would actually end up being a twist. The deep frown and the pained gaze were not as pronounced, but they were there. The signs of a man retreating into his shell. No, not his shell. In fact, while it was everything to Tristan, it was really… nothing to me (at least not a negative) in regards to his personal beauty, strength and amazing worth. One without the other, in such an environment, is a nightmare to even think about. But eventually it becomes more than just being “left alone” if the other is harmed. It becomes ALL ABOUT the well being of the other. I go inside the plane and rip another length from my wedding dress. Its designated role is providing fabric for torches now. The first few times, it felt like ripping my skin away. Like robbing myself of the thing that preserved my hope. But now I recognize the dress still embodies hope, albeit a different hope than before. Before, it meant fulfilling my dream of getting married. Now it fulfils my hope of staying alive and keeping beasts away. And this is where I fell deeply in love with this love story. Because even though she is marrying her best friend, and in a way, HIS best friend… circumstances change them, and neither one want to live EVER… without the other. Tristan has gone to great lengths to protect me these past weeks. As I drift off to sleep again, a frightening awareness wedges its way into my mind. I thought the bond between us here in the rainforest was one of friendship. But maybe it’s more. Maybe I feel more than I think for this man who’s not only the strongest person I’ve met, but who also seems more determined to keep me alive than himself. And I will let you live, love, and experience the bad and the beautiful, with them. “Can I tell you something very selfish?” he asks. GAH!!! I’m right there with you, Tristan!!!!! *sigh* Fine…. we’ll try to leave ’cause that’s what normal people do. *eyeroll* Tee heeeeee!!!! But I can’t be the only one, can I? Eeeeeep! I’m at a bad part. Never mind… it’s dangerous out there. I wanna go hooooooome!!! LOL! Who knows what happens? 😉 Oh wait. I do!!! LOL!! And the book just gets better and better as it goes. Especially that ending. As good as the whole story was, it is the ending that truly give this book that *oomph* that makes one unforgettable! MichelleF: It was a bit slow at times and I felt the characters could have been much more developed. However, the emotion of the last few chapters completely made up for it. Snotty-tissue cried in the epilogue!